Previous version Doodle Army 2 : Mini Militia 3.0.136 apk for Android will help you to downgrade or install older app easily. This is one of the best Action apps. In addition to the quick play, the other mode is multiplayer mode. In this mode we can choose survival, deathmatch or custom. 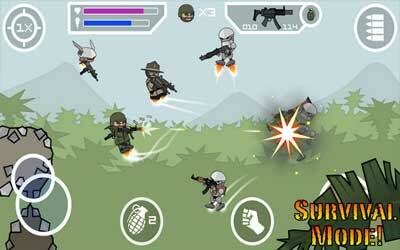 The variety of game modes make this game very popular and not boring. In the terms of control, you’ll see two virtual joysticks, like the game in general. The left side is used to direct the player. You can also fly by directs upward. On the right is used to direct the shot. There are several buttons during the game, the bomb button located on the left. You can choose weapon by tapping the top right button. The left side contains information on health and your rocket. In terms of display, the game has 2D graphics but good enough. Do not experience lag while playing and running smoothly. Doodle Army 2 Mini Militia aka DA2, based on the original stickman shooter Doodle Army, was created based on player feedback and suggestions. Added new Avatar selections and vibrant festival/club color choice combinations. Score Sync config tool to aid support with migrating scores to the new score storage system. I like the first game, it’s really cool with mini games and boss battles, until I find this game on play store. This game is better than the first one.